It’s good to be back in Jerez once again, especially at Festival time. The sun is shining and the whole town is buzzing! The Twentieth Festival de Jerez is underway, inaugurated, last weekend, by Eva Yerbabuena in the Teatro Villamarta and David Lagos in the Sala Compania, both to rave reviews. Music is in the air, where ever you go. 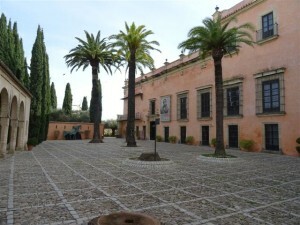 There are a lot of additional events this year, short recitals in local churches – we are going to one such in the Convento San Agustin ( a newly restored seventeenth century building ) this evening. These short concerts include big names, in this case Mercedes Ruiz, David Lagos and Santiago Lara, with Debora de la Fuente on cello. We’re looking forward to that and plan, later, to take a tour of the flamenco bars and penas, the local flamenco clubs which open their doors to the public during festival time. An ideal Saturday night, though best watch the sherry consumption, that particular amber nectar slips down all too easily. I have a reason, other than proper sobriety, to stay alert, I’ll be trying to capture the performances on video to share via The Story Bazaar. The Tabancos feature more prominently this year than formerly and this is being billed, a la Broadway, as ‘Off festival’. Tabanco El Pasaje, one of the most authentic, has over thirty performances during this year’s event. There is a lot to see in the daytime too and not just flamenco performances, but art exhibitions such as ‘Arte Jondo, con tinta china’ by artist David Vaamonde. The far east is something of a theme this year, not only in the visual arts, but in the flamenco itself. There is the first appearance of a male Japanese flamenco dancer at the Festival ( see Preview ). Flamenco is very big in Japan and companies of dancers have appeared here before, but not a leading dancer. 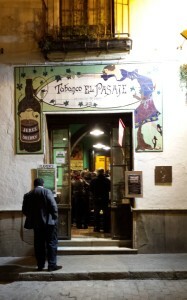 It seems that there are even more Japanese than usual in town, come to support their compatriot in the city of flamenco. Cooking and gastronomy also feature this year. For the first time there is Flamencook and a ruta enogastronomica around the town for flamenco inspired tapas. All the bars and restaurants are full to bursting, reservations are very necessary. Nonetheless, we plan to visit all our old favourites as well as any new ones we can find. And to indulge in a favourite festival experience, breakfast, or at least coffee and buns, in a beautiful, sunny square reading the Diario reviews of the performances which we went to see the night before. Perfect. 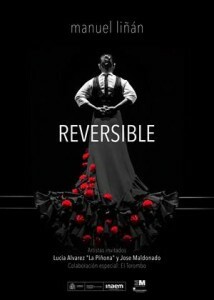 Tomorrow we are off to the Teatro for ‘Reversible‘, the stage show of Manuel Linan, ( see left ) the remarkable dancer who we saw for the first time last year with David Carpio. This year he has a company of his own and it promises to be a highlight, the Teatro was sold out weeks ago. I will be posting a review of this, and of the convent recital, later in the festival, as well as reporting on other events. In particular, we will keep a look-out for any flamenco flash-mobs and go dancing in the streets. Watch this space. This entry was posted in From a Foreign Field and tagged Foreign field by juliej. Bookmark the permalink. This post was corrected on 1st March. The Japanese gentleman leading tonight at the Teatro Villamarta is a dancer, not a singer as previously stated. His show is a sell-out. I am in the process of booking my flight for the 2017 Festival de Jerez, and I want to make certain to get tickets for shows as early as possible. I just got back from La Bienal in Sevilla, and some of the shows were already sold out by the time I figured out how to buy tickets online. Do you happen to know how and when to get advance tickets for the shows that require tickets? Once the Performance Programme is announced there will be links on the web-sites, either that of the town hall at http://www.jerez.es or the festival specific site http://www.festivaldejerez.es, which will enable you to buy tickets on line quite easily (I’ve done it before). The courses running during the Festival are already up there now, but not the artistic programme. I’ve been going to this for years and I’ve usually been able to book tickets via these sites well in advance or even buy them from the box office on Calle Medina (though the really popular performances do sell out early). So it’s worth keeping an eye on the web-sites. As soon as they’re live I’ll be booking ours – and telling folk that they’re available on http://www.thestorybazaar.com.